With the new text-area called Template you can arrange each post details. You can arrange the order and you can also get elements in the same line or get a element in the next line. The next HTML element should be in the same line. The next HTML element will be rendered in a new line. With this in your mind you can use and add all post details we support with placeholders. More in the documentation. 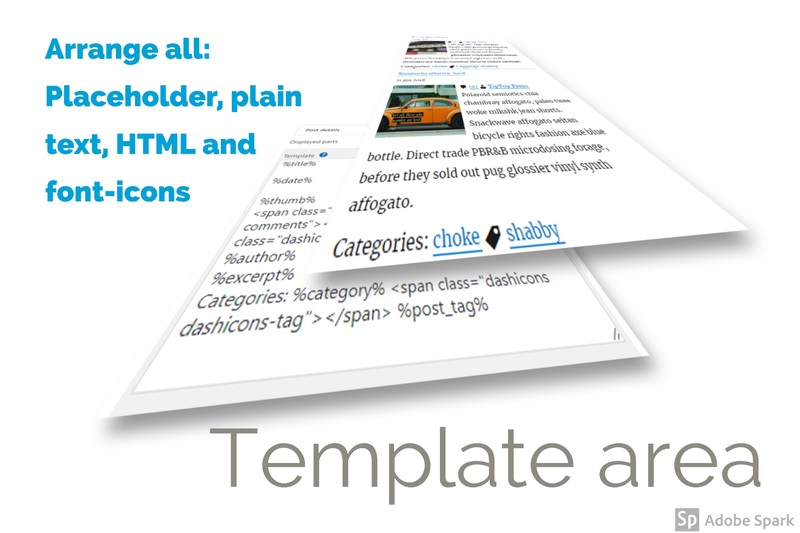 Additional you can use HTML, plain text or font-icons (we suggest the Dashicons HTML). To have the title on the right side of the thumbnail, use only new line between the thumbnail and the title placeholder. To have the excerpt below the thumbnail, use a empty line between the placeholder before the excerpt placeholder. If you want some post detail at the top, like the post tags and the post author, use a empty line between this placeholders and the next, here the thumbnail placeholder. The excerpt should at the right side from the thumbnail, use only a new line between the excerpt placeholder and the placeholder above till the thumbnail placeholder. As mentioned you can use the WordPress Dashicons and any HTML you want, like links to twitter.com. Below the Template we have premade examples. Choose one and select it with the button to take the selection over to the Template. To insert a comma or other separator between Tags or Categories () in the Template use the :after CSS pseudo class and add this selector to your Customizer.